To all the monster girls. Nimona tells the story of a teenage shapeshifter with a mysterious past. The comic opens when our protagonist approaches wizard Ballister Blackheart and informs him she’ll be his new sidekick. Blackheart is, as Nimona puts it, “the biggest name in supervillany”, and she’s only too happy to help him thwart the plans of the Institution of Law Enforcement and Heroics. Nimona is set in a world that combines elements of traditional Ye Old Times fantasy (wizards, dragons, knights in actual shiny armour) with current technology: there’s television, modern hospitals, and state of the art research labs. However, the most interesting thing about this world is how it’s obvious from the start that there’s a huge disconnect between the official narrative of heroism and villainy and what’s actually going on in the kingdom. The Institution of Law Enforcement and Heroics, its Director, and its champion Ambrosius Goldenloin are Good because people are told they are Good — even when it turns out that the Institution is responsible for some ethically dubious plans, to put it mildly. Ballister, on the other hand, is a supervillain because he exists outside established power systems and devotes his time to exposing them. This, the official story goes, makes him Very Bad Indeed, even when his interests are aligned with those of the majority of people. The official narrative about Lord Blackheart and Sir Goldenloin (let us pause for a moment to consider how great their names are) is simultaneously established and fragile. Time and again, we watch the Institution engage in media spin and damage control to prevent people from discerning the truth — all as Ambrosius’ discomfort with the organisation he’s a part of grows. Ambrosius Goldenloin, by the way, has a complicated history with Ballister Blackheart: the two trained at the Institution together and were very close, until the day of the fight that declared Ambrosius a champion and cost Ballister his right arm. Getting to the bottom of what happened between them is a big part of Nimona’s emotional arc. This is only one of the many ways in which Noelle Stevenson subverts dominant narratives in Nimona: the most central ones have of course to do with Nimona herself. First of all, there’s the fact that this story is very much about her. She introduces herself to Ballister as his sidekick, but, well, there’s an important hint in the comic’s title. The two go on to develop a respectful collaboration that doesn’t erase her, and as the story progresses we learn more about Nimona’s past. Although her relationship with Ballister is central to the story, Nimona’s life is never portrayed only in terms of how it affects him. His care for her gives heart to the narrative, but readers aren’t invited to emphatize with Nimona solely in light of this care. We think of men as antiheroes, as capable of occupying an intense and fascinating moral grey area; of being able to fall, and rise, and fall again, but still be worthy of love on some fundamental level, because if it was the world and its failings that broke them, then we surely must owe them some sympathy. But women aren’t allowed to be broken by the world; or if we are, it’s the breaking that makes us villains. Wronged women turn into avenging furies, inhuman and monstrous: once we cross to the dark side, we become adversaries to be defeated, not lost souls in need of mending. Which is what happens, when you let benevolent sexism invest you in the idea that women are humanity’s moral guardians and men its native renegades: because if female goodness is only ever an inherent quality – something we’re born both with and to be – then once lost, it must necessarily be lost forever, a severed limb we can’t regrow. Whereas male goodness, by virtue of being an acquired quality – something bestowed through the kindness of women, earned through right action or learned through struggle – can just as necessarily be gained and lost multiple times without being tarnished, like a jewel we might pawn in hardship, and later reclaim. This is the space Stevenson claims for Nimona: she’s been hurt, and she causes hurt in return, yet it’s impossible to read her story and walk away thinking she’s not worthy of love. I can’t believe I’ve written this many paragraphs and have yet to mention how funny Nimona is. This is a story where humour and heart always go hand in hand. It takes a darker turn in the last third or so, but all along it reminds us that, as Terry Pratchett so well put it, the opposite of “funny” is “not funny” rather than “serious”. 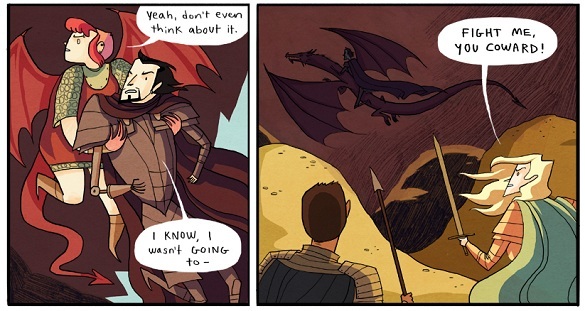 Nimona made me laugh out loud multiple times, even as it made me tear up only a few pages later. Before I finish, a quick word on Nimona’s presentation: it was wonderful to see that for all of her transformations, Nimona never shifts into a body type that fits into more conventional standards of female beauty. She’s fat and pink- or purple-haired and cute as hell, and this is how she remains through and through. The fact that this is how Stevenson chooses to draw her is yet another thing that matters. You've hit on so many of the things I loved about Nimona. Oh I can't wait to reread it (I'm currently delaying gratification on it). I love that there's never a whisper of a possibility that she and Blackheart would have a romance, too -- shouldn't feel subversive but it does. Yes, absolutely. They're friends and it's genuine and it matters. 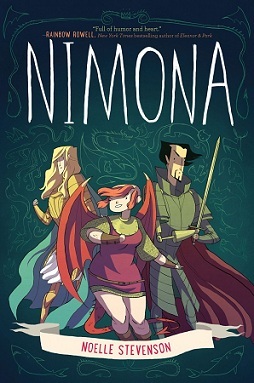 Nimona was my favorite webcomic, and I want to buy the book version of it and gift it to basically everyone on earth. "I’m still thrilled to find a character who occupies the sort of gray area traditionally reserved for men and remains sympathetic." Noelle Stevenson has written and drawn the most subversive story I've ever read, no less because it's a comic with a female protagonist and without a male gaze, without a love interest for her. Nimona is a riot, very much in every sense of the word, and I didn't know how much I needed a story like hers until I read it. :D Here's to many more amazing and subversive stories from Noelle Stevenson. This sounds fantastic! I'm going to have to look for it at my library. I hope they have it, and enjoy! Wow, how have I never even heard of this one before? Straight onto my wish list, thank you! YAY SUBVERSION. YES YES YES YES YEEEEEEEEEEEEES. And also: YES.